This is a pre-seasoned guitar with vibrant tones for the fingerstyle player. Pristine definition of sound combined with a vintage appearance. Lower register curtailed an otherwise well-rounded sound. Tanglewood has a legion of aficionados and professionals who swear by its acoustic guitars - from Fleetwood Mac’s founder Peter Green, to Grammy award-winning R&B artist Corinne Bailey Rae. Known for exceptional value, these guitars usually play host to a mixture of traditional and innovative design features. When the guitar lands on our doorstep we’re expecting to be in receipt of some form of melodious temptress. 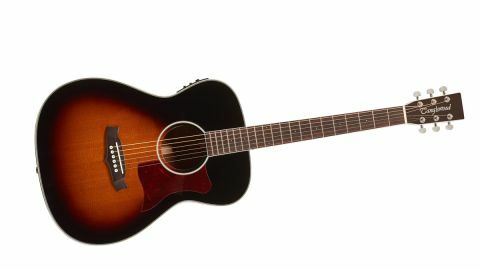 Its appearance is certainly seductive, with a sunburst spruce top that gives it an authentic, vintage feel. The back and sides are made from a rich mahogany red. The top, back and sides are all solid wood and finished in gloss. In contrast, the African mahogany neck has Tanglewood’s signature satin finish. The combination of the two finishes provide an exotic mix of the unassuming and the glamourous, making it an intriguing instrument right from the start. The solid spruce top is no ordinary one: it’s been subjected to a relatively new kiln-drying technique (one which sounds guttural to say the least) called torrefaction. What this means is that the spruce has been exposed to extremely high temperatures in an oxygen-free kiln until the moisture is reduced to zero percent. The moisture level is then carefully raised to between three and six percent. The idea is that the spruce then has more stability and feels as if it has matured over a longer period of time. The effect on the sound and feel of the guitar is that it’s like an older, seasoned acoustic instrument. The neck is very snug in the left hand. Even though the nut width is the standard 43mm, it feels more compact, possibly owing to the C-shaped profile of the neck. It feels easy to stretch across the fingerboard. The scale length is 650mm, so not out of the ordinary for an orchestra model. Our slightly smaller (but ever so nimble) man hands can, at a squeeze, reach the sixth fret. There’s a smooth transition for the left hand up the Sonokelin (a material similar to Indian rosewood, but less dense) fingerboard, which is decorated with ABS pearl dots for the position markers. Orchestra models were originally designed to accommodate the guitarist who needed to contend and play with a brass band some 80 years ago, hence its need for a ‘punchy’ sound. When played, the strings of the X70 TE have absolute clarity. For the right hand, it responds well to punchy chordal strumming. Protecting the top is a tortoiseshell pickguard, so don’t feel like you have to hold back, but this orchestra Tanglewood favours the fingerstyle approach. It handles all manner of folk-playing with unadulterated ease. For a change of pace we try a snippet of J.S. Bach’s Lute Suite in E Minor. The results are surprisingly good. There’s clear differentiation across the strings and Bach’s melodies carry with an almost delicate poise. The mid and upper ranges are particularly strong. The very top notes have something of a natural reverb, which is impressive to say the least. When trying the blues (something this guitar is probably more geared towards) the bass is fine, but not as chunky as we’d like. The design of this guitar has been honed so much towards having a balanced sound it’s hard to make the bass as resonant, compared to the upper registers. This is a relatively small detail in an otherwise exceptional Tanglewood orchestra model. The bass, however, is something the onboard Fishman Presys Plus electronics can help to rectify. With the three standard equalizers we tweak the bass down a fraction and keep the mid and top on a level. The result is that the X70 TE produces a well-balanced and full sound. We wouldn’t recommend turning up the Brilliance, which is supposed to give ‘sparkle’ to your sound - it doesn’t need it. You could try the ‘Phase’ to give the lower end a punch, but when we try ‘Phase’ it overwhelms the mix. Stick with the bass control. The electronics also include a tuner that’s simple to use. It provides a swift, quiet transition from checking your d-tuning to performance mode without fuss - perfect for the more advanced player who may need it mid-song. Perhaps it’s because of the Acus acoustic amp, but the sensitivity and subtlety of the pickups and preamp make it sound as if the guitar has an invisible friend playing in absolute unison, not so far away. It gives the Tanglewood an authentic acoustic stage presence without giving away the fact that it’s being amplified. Together, the guitar and amplifier are a winning combination we’d highly recommend. As a point of comparison, we paired the Tanglewood X70 TE model with a Blueridge BR-73A, which uses spruce for the top and rosewood for the back and sides, and sits a shade above the price bracket of the Tanglewood. The Tanglewood is an orchestra model while the Blueridge is an 000 model. Both guitars are built smaller than dreadnoughts and jumbos, so make a good pairing for review. Usually orchestra models tend to have slightly longer scale-lengths than 000s but in this case, both models have a scale length of 650mm. With all its inlaid abalone pearl, the Blueridge doesn’t match the Tanglewood in terms of clarity of sound and projection. The orchestra shape of the Tanglewood makes it supremely comfortable for sitting and playing. The curve of the upper bout seems almost as steep as classical guitar models and makes it the perfect rest for the right arm. Playing while seated with a chilled beer is a must! If you’d prefer to stand, that would also be fine as the guitar comes with a chrome end pin and strap pin at the heel. Tanglewood has wasted no expense in attention to detail. Even the strings have been carefully selected to provide the guitar with its clean, gilded tone. The string set of choice is the Elixir Nanoweb Phosphor Bronze, which is designed to deliver a longer-lasting bright and lively tone, mimicking the sounds of uncoated strings - all owing to a special Nanoweb coating. What exactly the Nanoweb coating is seems to be something of an industry secret, but the sounds of the strings emanating from the guitar certainly seem to live up to this claim. Whether they are longer-lasting or not, we’re unable to test. Only time will tell. Other details on the Tanglewood include some smart, clean ABS black and white binding on the top, back and sides (along with the rosette), which provides a stark contrast to the natural woods and dusky black of the burst spruce top; a seamless solid neck-to-headstock African mahogany; a dark, rosewood veneer to the headstock embellished with the genuine mother of pearl Tanglewood logo; an adjustable truss rod in the soundhole, so you can fine-tune the action depending on your particular taste, and high-quality chrome machine heads provided by Grover. Where this guitar steps beyond the groove and into the realms of innovation is in its internal bracing system. Named the Sanden Special Fan Brace (after the Swedish luthier and design consultant for Tanglewood, Michael Sanden) what you have going on under the hood is a clever combination of fan bracing, more commonly associated with classical guitar making, and x-bracing, the structure found in most acoustic guitars. This is designed to achieve ‘drawn out harmonic sustain and evenness of tone’ as described on Tanglewood’s website. How well this translates into the sound it makes in my bedroom is hard to tell, but the harmonics have a cool freshness that leave larks croaking at the dawn. The evenness of tone we’ve already discussed. Any guitar priced at £899 sounds a little on the expensive side for the average acoustic guitarist, but with all the clever and innovative features this guitar offers, this is an amazing price. That said, it doesn’t come with a gig bag. The X70 TE has many hallmarks of an instrument that will age well. Given the treatment the spruce top has had, if you want to look like you’ve been playing for longer this is probably the instrument for you. Otherwise we’d recommend this guitar is picked up by songwriters and open-mic’ers looking to take their playing to the next level. Word is that Chesney Hawkes himself has a small selection of Tanglewoods, so you’ll be in good company.